‘Hit By Avalanche In Everest Basecamp’ — that is the title of this rough video, loaded today on YouTube from Nepal. German climber Jost Kobusch captured the footage, which shows a huge cloud of snow engulf base camp as climbers cower for their lives. 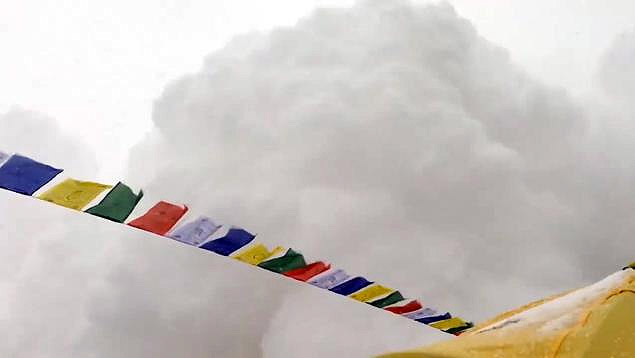 This is the first footage we have seen from the event, which occurred earlier this weekend on the world’s highest peak. “The ground was shaking from the earthquake and as soon as we saw people running… we were running ourselves to save our lives,” Kobusch wrote. It’s a scary first-person perspective on a tragedy with depths still unfolding. See our original article on the Earthquake On Mount Everest for more details on a scene that reveals a microcosm of the larger disaster taking over Nepal.